The library is closed on Sundays and some holidays. The library follows bad weather closing & snow days based on Pocono Mt. School District. See www.pmsd.org for more information. You can also find the information on network TV news scroll, or via our facebook page. 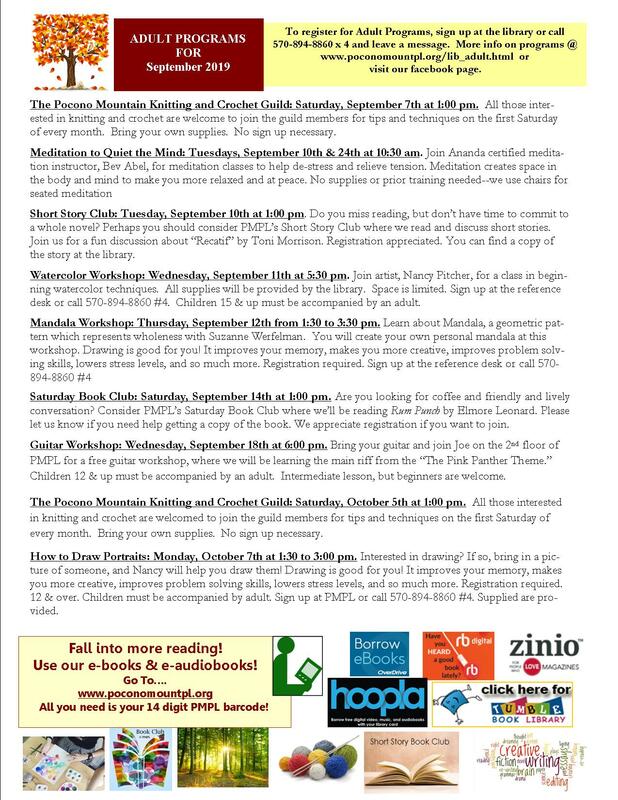 Pocono Mountain Public Library strengthens the community by encouraging lifelong learning, stimulating intellectual curiosity, and promoting a literate and informed citizenry by providing a variety of information resources for all and enriching patrons’ lives through educational, cultural, and recreational programs. The Library also has a small tutoring and conference room on the second floor that can accomodate 6 people. This room has a table, computer and white board for small group instruction, tutoring, home school and charter school use, proctor tests and other educational needs. Please call with any questions and to book it. 570-894-8860. There are no fees for this room if it is used for educational purposes. Our dedicated, volunteer Board of Trustees are appointed from either Coolbaugh Township or Mount Pocono Borough, for three year appointments. People interested in serving on our board should contact a board officer or the library director. Board officers are expected to be involved in the community and assist with fundraising for the library. Library Board meetings are open to the public on the first Wednesday of each month at 7:00 pm in the second floor conference room. Ann C. Shincovich, M.A., M.L.I.S. 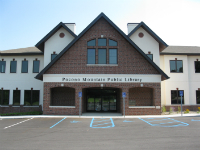 Pocono Mountain Public Library belongs to the Easton District Libraries, and is a member of the Associated Libraries of Monroe County. The Libary receives annual State Aid from Pennsylvania Commonwealth Libraries, which is about 12% of our total operating budget, and one mill in tax support each from Mt. Pocono Borough and Coolbaugh Township which comprises the majority of our annual budget. We also receive one mill from Coolbaugh Township to support our new library building construction and bond repayment which ends in 2029. 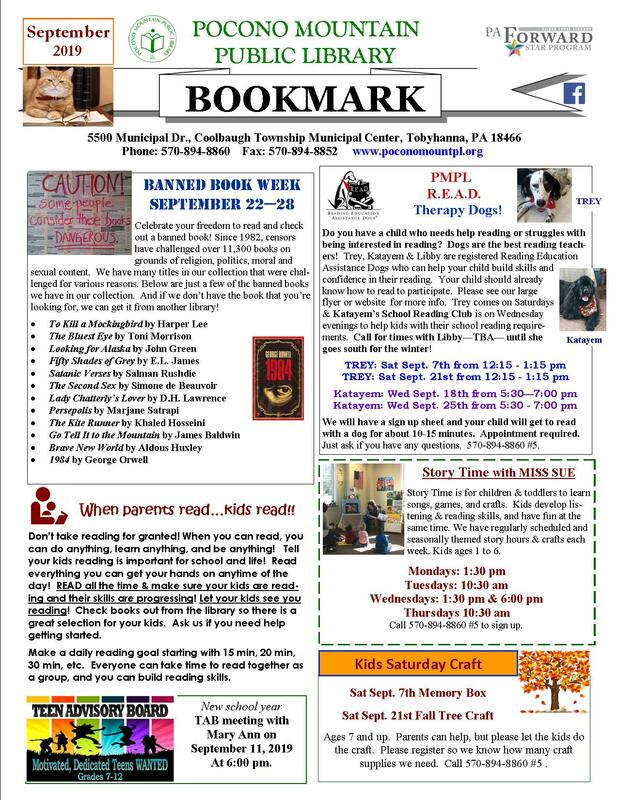 The Coolbaugh Township Supervisors are significant to the success of the library. As of 2018, the Library has received over $750,000 in major gifts from the R. Dale & Frances Hughes Foundation since 2012 for both capital and operating expenses. PMPL reserves the right to close for bad weather. If Pocono Mountain School District is CLOSED, the library is also CLOSED. Check the local listings on the tv or internet. No fines are charged for days the library is closed. Call 570-894-8860 if you have any questions.